In recent weeks, we released our 2015 B2B and B2C Content Marketing Benchmarks, Budgets, and Trends, North America reports: the first rounds of findings from our annual content marketing survey. Now, for the second year, we’ll take a look at the content marketing practices of nonprofit professionals. 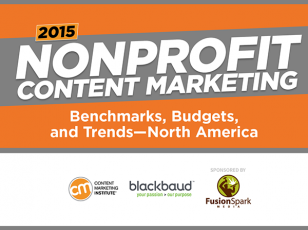 In Nonprofit Content Marketing 2015: Benchmarks, Budgets, and Trends—North America, created in partnership with Blackbaud and sponsored by FusionSpark Media, we present some truly exciting findings about this segment of marketers. Most notably, it’s been great to see how nonprofit marketers have grown in their use of content marketing, and are driving efficiency and making progress using the resources (even if limited) they have. Nonprofit marketers are doing more with content marketing – and feeling more confident about their effectiveness. They’re trying more tactics, using more social media platforms, growing in their internal knowledge and skills, and focusing on becoming better storytellers. Here’s a quick list of our favorite insights from this year’s report, including what a best-in-class nonprofit marketer looks like. 1. Sixty-one percent of nonprofit marketers use content marketing. 2. Thirty-five percent say their organizations are effective at content marketing (up from 26% last year). 3. 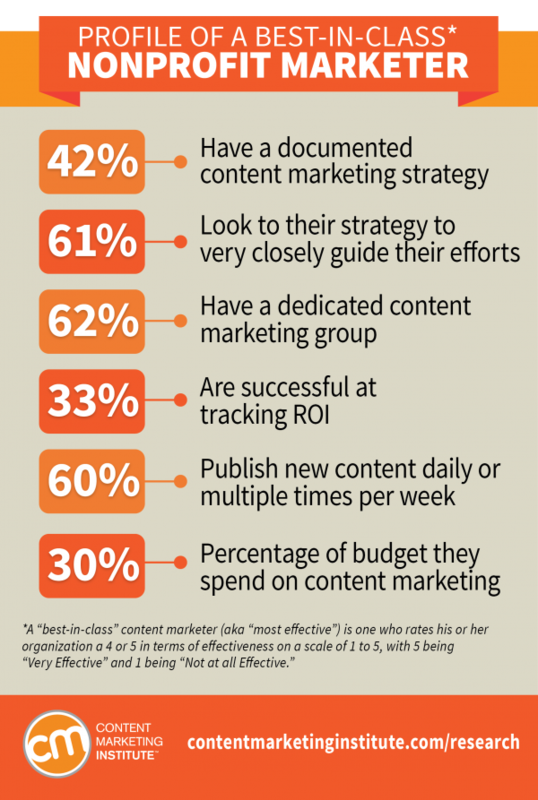 Twenty-three percent have a documented content marketing strategy. Those who do rate their organizations as more effective in all areas of content marketing (43% have a verbal only strategy.) Note: It’s interesting to see how “developing a documented content marketing strategy” was the second highest initiative (37%) that nonprofit marketers plan to work on in the next 12 months, indicating that they see the importance of doing so. 4. Nonprofit marketers who have a documented content marketing strategy allocate more of their marketing budget to content marketing (33% on average) when compared with the total sample (23% on average). 5. Fifteen percent of nonprofit marketers say they are successful at tracking ROI; however, having a documented content marketing strategy helps (34% of those who possess one say they are successful at tracking ROI). 6. Lack of budget is still the greatest challenge for nonprofit marketers, but the proportion citing it this year went down (67% last year vs. 56% this year). 7. Sixty-nine percent are creating more content than they did one year ago. 8. Nonprofit marketers are using an average of 12 content marketing tactics this year vs. 11 last year. 9. The biggest increases in tactic usage have been with infographics and microsites, both up 22 percentage points this year. 10. Many more nonprofit marketers began using microsites over the last year (19% vs. 41%), and 53% find them to be effective. 11. The initiatives that nonprofit marketers report working on most are: becoming better storytellers (66%), creating visual content (63%), and creating more engaging/higher-quality content (62%). 12. The initiatives most often cited by nonprofit marketers as ones they’ll begin working on within the next 12 months are: measuring content marketing ROI (39%), and developing a documented content marketing strategy (37%). 13. Nonprofit marketers cite Facebook as the platform they use most. Usage has risen from 91% last year to 94% this year. 14. Nonprofit marketers are using an average of five social media platforms this year vs. four last year; Instagram had the biggest increase in usage (from 17% last year to 38% this year). 15. Nonprofit marketers gave higher effectiveness ratings this year to all but one of the social media platforms they use (Vimeo usage was down two percentage points). What does a best-in-class nonprofit marketer look like? What do you think of this year’s findings? Do you find anything unique or surprising about the results? Share with us in the comments. If you are interested in research, we have many more new findings coming your way, as well as explanations of the “whys” and the “what nexts.” Subscribe to our email so you don’t miss anything.